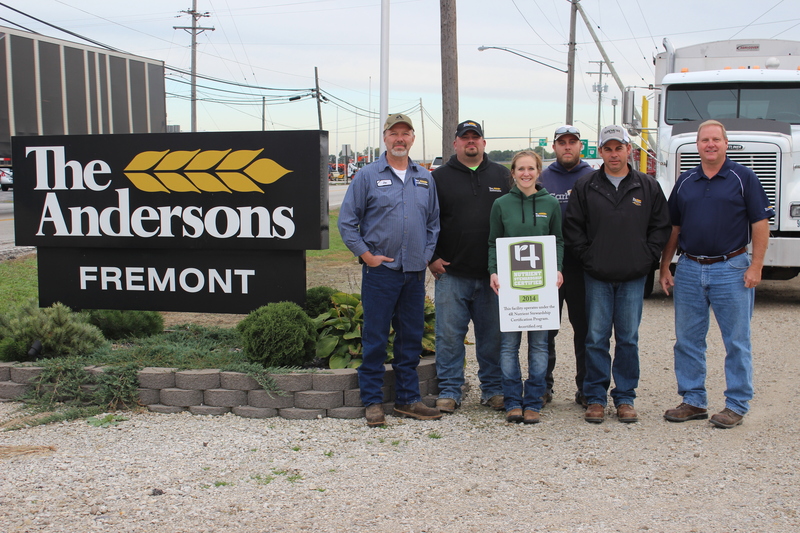 COLUMBUS, Ohio (Oct. 13, 2014) – The 4R Nutrient Stewardship Certification Program has announced that The Andersons, Inc.’s Fremont, Ohio facility has been added to its growing list of nutrient service providers to achieve certified status. The voluntary certification program is a concentrated effort by the agriculture industry to significantly reduce and prevent applied nutrients from running off fields, which has contributed to harmful algal blooms in Lake Erie, such as the one responsible for the shutdown of Toledo’s water supply in early August. As one of the largest grain operators in North America, The Andersons features grain elevators, fertilizer distribution terminals and farm centers in 10 states and Puerto Rico with an annual capacity to store up to 139 million bushels of grain and 2.1 million tons of dry and liquid fertilizer. The company distributes and produces a wide array of liquid and dry industrial products and is the largest producer of pelleted lime products in the United States. The Andersons also manages four ethanol plants for respective LLCs that produce 330 million gallons of ethanol. “It is very important for us to be proactive in the algae issues in Lake Erie, especially since we are located very close to the Western Lake Erie Basin and its tributaries,” said John Fritz, precision ag specialist – ag advisor with The Andersons. The program certifies that individuals and entities in the Western Lake Erie Basin that sell, apply or make recommendations on how fertilizers should be applied to crops are doing so in accordance with 4R Nutrient Stewardship principles — which refers to using the Right Source of Nutrients at the Right Rate and Right Time in the Right Place. Applicants must go through an audit and demonstrate they not only understand 4R principles, but also follow them. Approximately 50 facilities servicing more than 1 million acres in the Lake Erie Watershed in Indiana, Michigan and Ohio have signed up to go through the certification program. MEDIA: Download the high-resolution photo of The Andersons’ Fremont Facility receiving its 4R Nutrient Stewardship Certified sign.